Are your concerned about your dog’s metabolism, its energy levels, or protein synthesis? 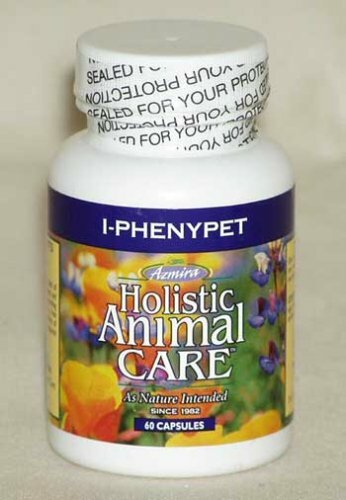 If these are issues of note in your dog’s health then you should consider giving it some amino acid supplements. All the states issues can lead to unwanted health problems majorly touching on the dog’s active life. Amino acid supplements are focus on boosting healthy muscles and maintain conditions for the health and wellbeing of an active dog. 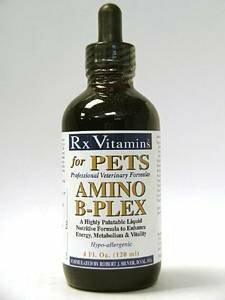 PetMedsToday.com has the most popular and besting selling dog amino acid supplements in the market. Get in touch today and get these supplements that will give your dog good healthy muscles which are essential for your pet’s health. We've recently reduced the sale price down an additional 10% off. Buy now and save. 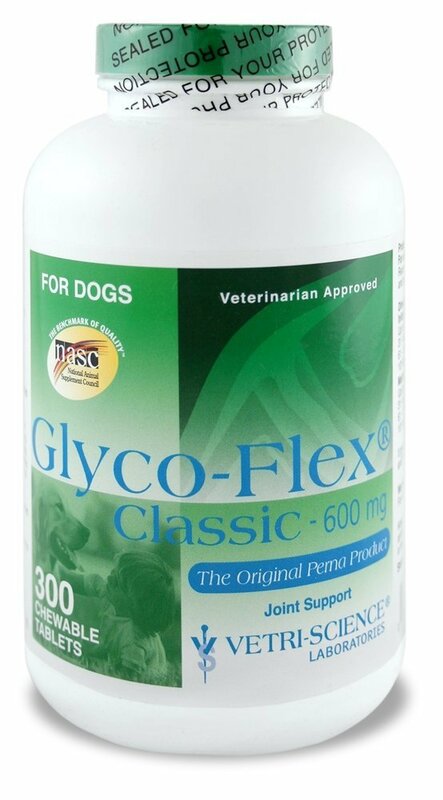 GlycoFlex® is a nutritional dietary supplement for dogs of all breeds throughout their lives. It is made from pure freeze-dried Perna canaliculus (Green-Lipped Mussel from New Zealand). It contains all major classes of glycosaminoglycans (GAGs) including Chondroitin -4- and -6- Sulfates. The Perna in Glyco-Flex® is also rich in amino acids, naturally chelated minerals, numerous enzymes, vitamins, and nucleic acids (RNA and DNA).Each chewable tablet contains 300 mg Perna canaliculus (Green Lipped Mussel). Ingredients: Perna canaliculus (Green Lipped Mussel), Brewer's Yeast, Alfalfa. Comparison between old and new formulas. 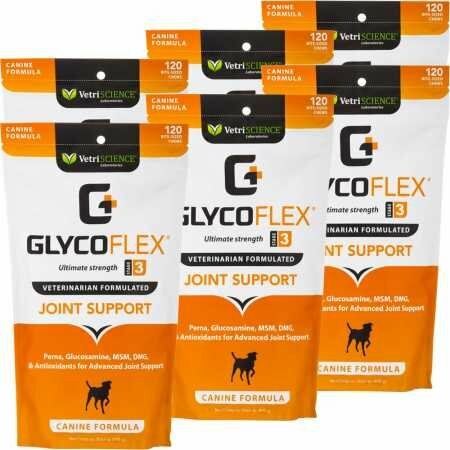 Glyco Flex 1 Hip and Joint support for dogs is the first stage in our comprehensive whole life joint health program. 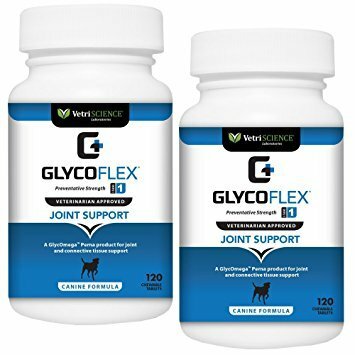 Glyco Flex 1 is the best way to start joint support for large dogs, dogs that suffer growing spurts or pains and dogs that will be working dogs or competitive athletes. 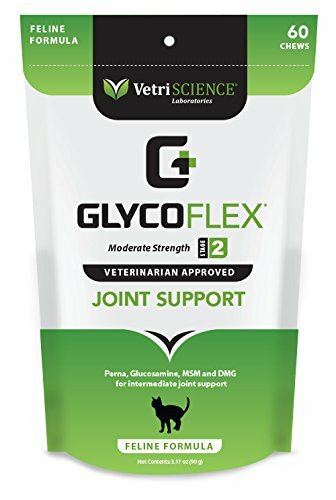 The active ingredients provide nutrients essential to proper connective tissue and cartilage function. 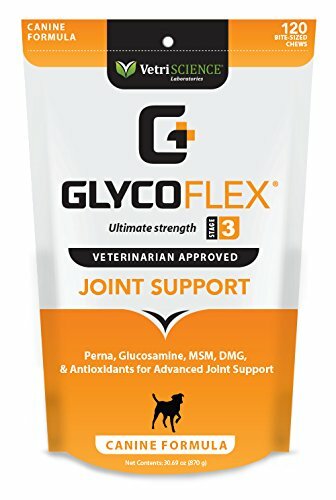 The addition of our patented DMG offers excellent immune system support and helps alleviate joint discomfort that comes with day to day activities and play. 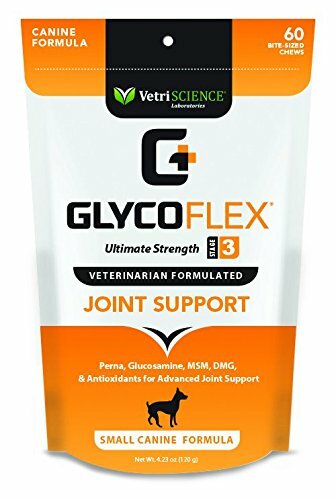 GlycoFlex 1 contains Perna canaliculus, Glucosamine HCl, and Dimethylglycine to help support the rebuilding of collagen, cartilage, and joint structures. It is part of the VetriScience stage of life program. STAGE 1, REINFORCEMENT, for younger dogs or dogs predisposed to hip or joint dysfunction for the maintenance of optimal joint health. 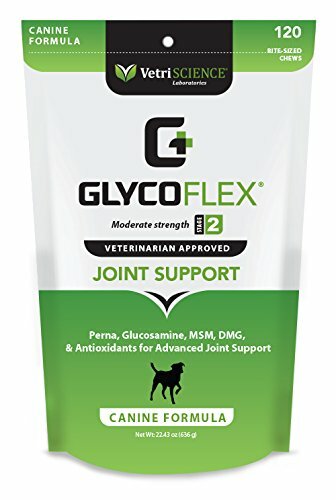 GlycoFlex 1 supports the structure and function of joints and connective tissue for puppies and dogs throughout their lives. Comparison between old and new formulas. 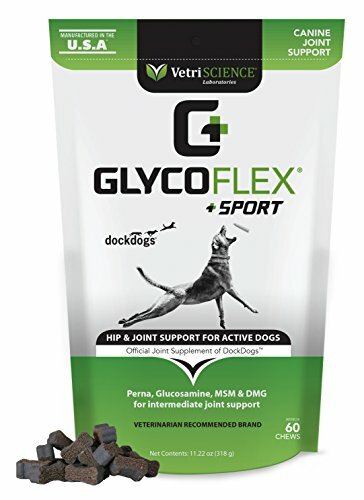 Dosage: The usual dose of GlycoFlex 1 soft chews for the first 46 weeks: Weight of Dog Amount per Day up to 30 lbs 1/2 tablet daily 3160 lbs 1 tablet daily 61100 lbs. 2 tablet daily 101+ lbs 2 1/2 tablet daily Maintenance Dosage: Weight of Dog Amount per Day up to 30 lbs 1/2 tablet ever other day 3160 lbs 1/2 tablet daily 61100 lbs. 1 tablet daily 101+ lbs 1 1/2 tablet daily If giving more than 1 tablet, divide between AM and PM. 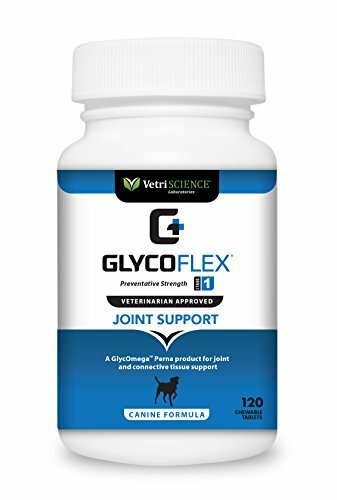 GlycoFlex I contains Perna canaliculus, Glucosamine HCl, and Dimethylglycine to help support the rebuilding of collagen, cartilage, and joint structures.It is part of the VetriScience stage of life program. STAGE 1, REINFORCEMENT, for younger dogs or dogs predisposed to hip or joint dysfunction for the maintenance of optimal joint health. 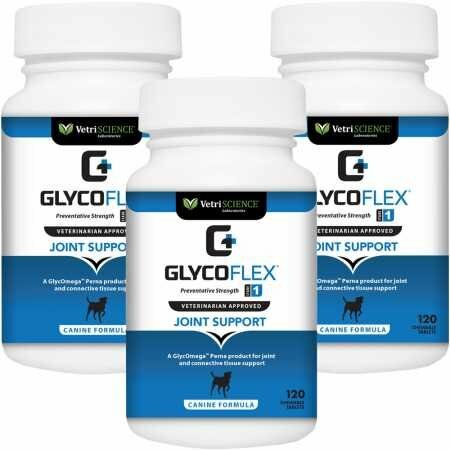 GlycoFlex I supports the structure and function of joints and connective tissue for puppies and dogs throughout their lives. 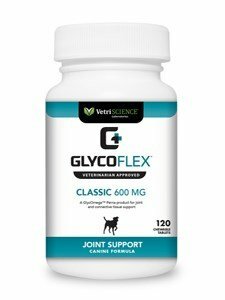 VetriScience Laboratories GlycoFlex 1 Chewable Tablets are recommended by veterinarians for puppies and dogs with an early need for basic joint support. 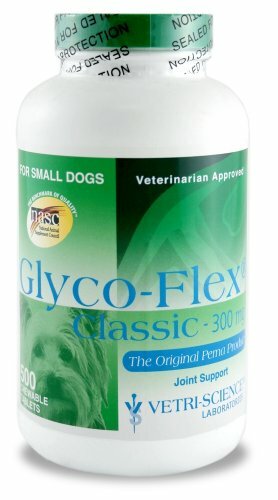 It features 600 milligram of perna caniliculus, 500 milligram of glucosamine and 100 milligram of our patented DMG. GlycoFlex products contain perna, an edible green-lipped mussel from New Zealand. The perna has been freeze-dried so that the whole organism is included, providing many of the factors necessary to maintain healthy connective tissue. It is rich in amino acids, polypeptides, naturally chelated minerals, fatty acids, glycosaminoglycans (GAGs), vitamins, glycoproteins, protein complexes, polysaccharides and the nucleic acids RNA and DNA. Perna contains all major classes of GAGs including chondroitin 4 and 6 sulfates and hyaluronic acid that occur in connective tissue such as joint cartilage, tendons, ligaments, and synovial fluids. 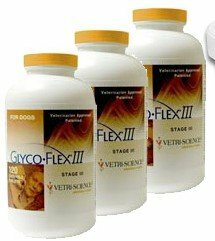 The perna used in GlycoFlex products is the GlycOmega brand perna canaliculus exclusive to VetriScience Laboratories. Directions for Use: Initial: (4 - 6 Weeks) Up to 30 lbs: 1/2 tablet daily 31 - 60 lbs: 1 tablet daily 61 - 100 lbs: 2 tablets daily 101 lbs and over: 2 1/2 tablets daily Maintenance: (After initial period) Up to 30 lbs: 1/2 tablet every other day 31 - 60 lbs: 1/2 tablet daily 61 - 100 lbs: 1 tablet daily 101 lbs and over: 1 1/2 tablets daily If giving more than 1 tablet, divide between AM and PM. 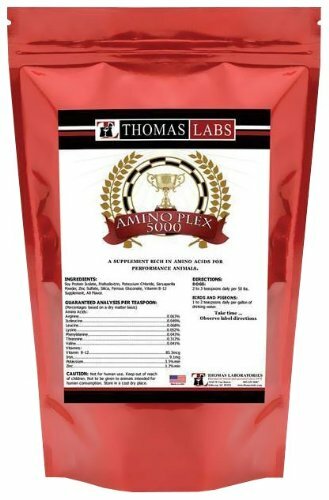 Product Facts: Active Ingredients Per Tablet: Perna Canaliculus (GlycOmega brand Green-Lipped Mussel) 600 milligram Glucosamine HCl (Shrimp and Crab) 500 milligram N,N-Dimethylglycine HCl (DMG) 100 milligram Inactive Ingredients: brewers yeast, cellulose, natural imitation chicken flavor, silicon dioxide, stearic acid. Active Ingredient per Tablet: Perna Canaliculus (GlycOmega brand Green Lipped Mussel), 300 mg. Inactive Ingredients: alfalfa, brewers yeast, cellulose, silicon dioxide, stearic acid, water. GlycOmega is a trademark of Aroma New Zealand Ltd.Protect from freezing and extreme heat.